Nixon Motor Sports: Behold, Corner Captain! Driving is the most fun part of autocross, make no mistake! 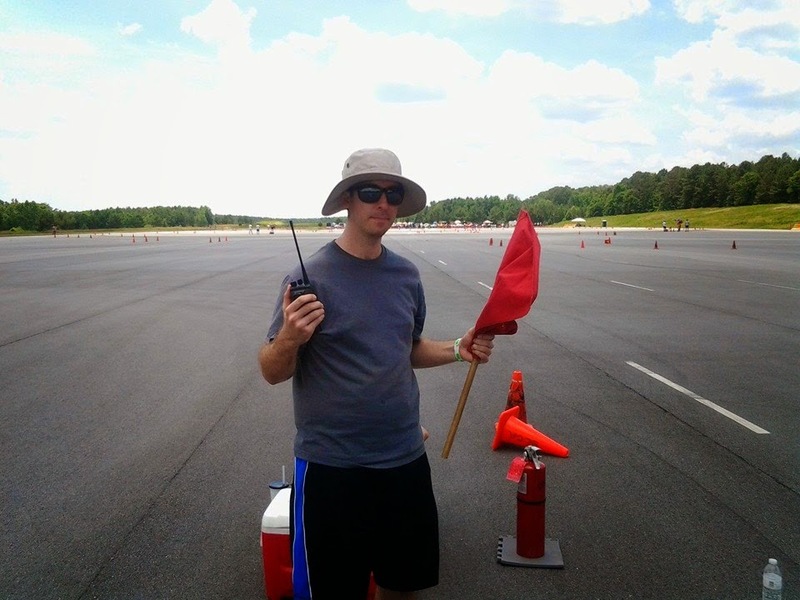 In return for driving at most autocross events, drivers also have to perform a work assignment while the other driving groups compete, so today let's take a look at one small part of autocrossing, the all powerful, amazing, super-powered volunteer worker known as CORNER CAPTAIN! Corner Captain has immeasurable super powers such as being able to prevent serious incidents BEFORE THEY HAPPEN! He merely has to vigorously wave his RED FLAG and utter the magic words of "RED FLAG, RED FLAG" into his race radio, and instantly, all other red flags on course will wave, and ALL drivers will immediately come to a full and complete STOP! On the rare occasion that a car stalls out or breaks down on course, Corner Captain makes full use of his super powers to ensure that safety and tranquility exist throughout the realm! Another super power held by Corner Captain is the all important race radio, which he uses to communicate with even higher powers, (and if he deems them worthy) share information with his lowly minions, the subservient corner workers whose sole task on this planet is to replace cones displaced by wayward drivers. As his minions scurry to replace cones before the next competitor passes his post, Corner Captain calmly cues his radio and calls in the cone penalty for the offending transgressor, with a gritty and steely tone of voice: "number 22 HS, plus one", and then, like thunder and lightning appearing from on high, the official scorer will annotate a penalty of plus one cone to the driver of chariot number 22 in HS class, thereby doling out a 2 second run time penalty thanks to the keen and ever observant abilities of Corner Captain. In addition to these super powers, Corner Captain is normally found in his natural habitat adorned in a shade rendering helmet of cloth, as well as ocular shields that prevent mere mortals from feeling the wrath of his detached yet superior gaze. In extreme cases, if need be, Corner Captain may even resort to using yon extinguisher of fire in order to save a valuable chariot. It is not known if Corner Captain would use the extinguisher on a minion that was on fire, but it is widely held that Corner Captain would surely rescue a competitors valuable engine before rendering assistance to a lowly cone jockey.